Students studying at Athlone Institute of Technology (AIT) are among the most satisfied in Ireland, according to The Sunday Times Good University Guide 2019 released this week. The Good University Guide, now in its 17th year, is Ireland’s only league table ranking the country’s 21 higher education institutes against one another. This student satisfaction rating comes off the back of a nationwide analysis, called the Irish Survey of Student Engagement (ISSE), which looks at nine aspects of the student experience, including: effective teaching practices, higher order learning, reflective and integrative learning, learning strategies, student-faculty interaction, overall quality of interactions, a supportive academic environment, collaborative learning and quantitative reasoning. AIT has consistently performed well in each of these areas and has topped the list in collaborative learning and quality of interactions in this year’s guide. The award-winning institute, which took home the accolade The Sunday Times ‘Institute of the Year’ in 2018, continues to enjoy the highest ISSE student response rate nationally (60.5% versus 27.2%). This is the first year The Sunday Times Good University Guide has taken the views of students into account since ISSE’s inception in 2013. Previously, this information fed into sector-level reports only but was introduced as a data point in keeping with international ranking and best practice norms. Other colleges to perform well in this area, include GMIT and the University of Limerick, the latter of which was named The Sunday Times ‘University of the Year 2019’. AIT has also outpaced its institute of technology competitors by a significant margin in the area of research. The educational powerhouse, defined by its commitment to academic excellence, rigour and applied education, achieved a score of 21 in this area, outstripping other IoTs by a minimum of five and a maximum of 19 points. Emerging as the number one institute of technology nationally is a testament to the world-class research being carried out at AIT and of the contributions made by its academic staff and three research centres - Materials Research Institute (MRI), Software Research Institute (SRI) and Bioscience Research Institute (BRI). The institute also houses two national technology gateways: APT, which specialises in polymer research and innovation, and COMAND, which focuses on delivering technology solutions for the software industry across multiple media platforms. The Midlands-based institute of technology has been making meaningful strides in pollinator decline, virtual learning environments, cybersecurity and compostable plastic research, and is on the cutting edge of research into smart drug delivery systems and interventional cardiology care. Some of this work has been conducted in partnership with prestigious academic institutions like Stanford University and the University of Oxford. This responsiveness to the needs of industry has seen the institute focus its research and innovation outputs on core areas of growth, namely disruptive technologies, and put conduits in place to transfer knowledge in a manner that supports its regional and national industry partners. As the institute progresses in its ambition of achieving technological university status, this increased research capacity will aid in forging partnerships with other third levels, for whom research, innovation and enterprise are central tenets. 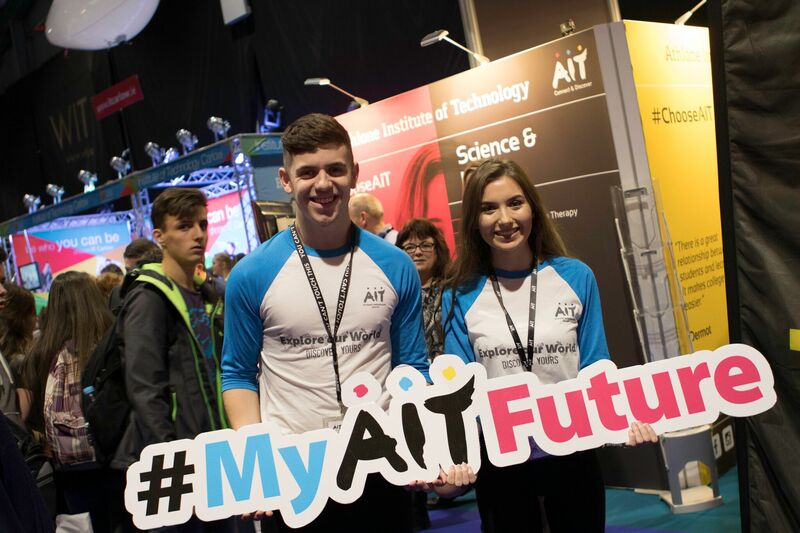 Distinguished by outstanding learner experience, applied education and an industry-focussed approach to research and innovation, AIT is currently ranked 9th nationally in The Sunday Times league table comprising of Irish universities and institutes of technology. Eight distinct criteria were involved in this adjudication, including student satisfaction levels, Leaving Certificate points achieved by incoming students, progression ratio, student academic achievement, expenditure on facilities, research profile, and employment prospects for graduates. Athlone Institute of Technology boasts a wide array of courses in the Faculties of Engineering and Informatics, Business and Hospitality, and Science and Health. For the full list of courses on offer at Athlone Institute of Technology, click here.